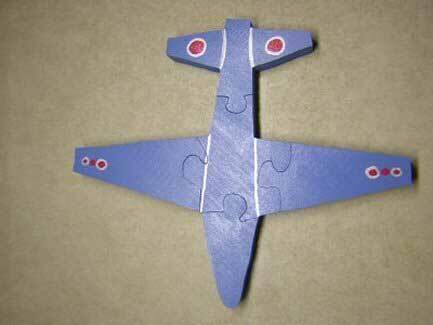 Return back to the Airplane Puzzle page. Using a power sander or hand sand the wood on both sides. Cover the wood on one side with clear packaging tape to provide the saw blade with some lubrication as it cuts. First saw the outside lines of the pattern with the #9 saw blade. Next, saw the individual pieces by cutting on the inside lines. Remove pattern and packaging tape.